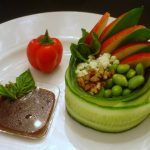 Wrapped thin cucumber strips are formed in a small bowl and filled with salad green, apples, snap peas, blue cheese and pecans served with balsamic vinaigrette. Slice cucumber into very thin strips. Curl into a medium sized circle. Cucumber will stick to itself if you overlap ends. Fill cup with greens, layer apple and pea pods stand on ends in back of salad. Add blue cheese and nuts to the left side of salad. Add soybeans to the right side. Serve vinaigrette in separate dish. Make vinaigrette; whisk together first 5 ingredients until blended. Gradually whisk in olive oil. Blend well. Serve with salad. Dressing can be made ahead and refrigerated up to 2 weeks. Can use dressing as a vegetable dip.